The story surrounding The Wenlock Arms is a romantic one. Situated just off City Road, stumbling distance from the Regent’s Canal, the pub first came to life in 1836, acting as the nearest outlet for the now defunct Wenlock Brewery to trickle her molten nectar into the mouths of thirsty punters. Nestled among the stark industrial walls of the surrounding area, The Wenlock’s new burgundy facade is akin to a mirage in the hot desert, allowing the local community to leave their worries at the door and indulge in yeast-enabled escapism for a few magical hours. The building, a rare Blitz survival in these parts, remains an unwavering source of good old-fashioned comfort in times of need. The age old appeal of a pub is the evidence of others within it; we go there to be among people, to indulge in conversation and to immerse ourselves in lives that are not our own. The everyman fug lingering in the air is something the polished wine bars of the nearby City can never emulate, and that is what draws people to boozers such as The Wenlock. The interior boasts a delicate composition of peeling leather stools softened by years of weary behinds and worn wooden tables with the ring marks of a thousand golden pints still visible on the surface. The ale pumps have perfected the precise level of cough and splutter through hours of practise, and the windows know exactly when to steam up, shielding the frivolous drinkers from the prying eyes of the outside world. 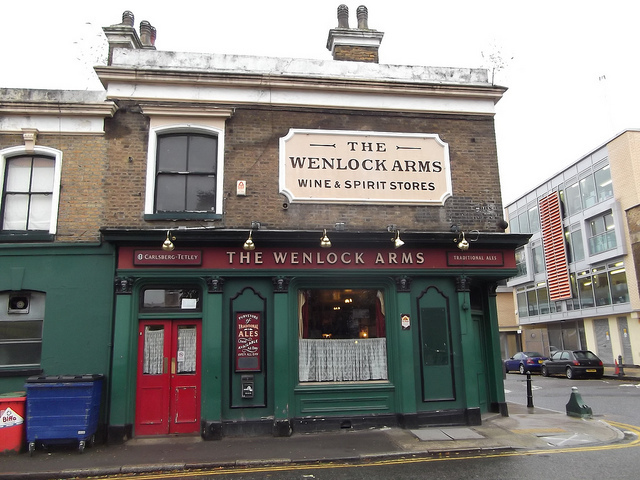 It comes as no surprise, then, that when threatened with demolition in 2010 a passionate campaign erupted to save The Wenlock Arms. Even Hackney Council were forced to pay attention, and as a result extended the Regent's Canal Conservation Area, meaning that the pub is now a protected building. The Wenlock has recently been taken over by the owners of The Red Lion and Sun in Highgate Village. They've stayed true to the pub's history and kept her features unchanged. Co-owner Heath Ball, who runs the place with Marcus Grant, recognises that every pub has its own personality, and as a result needs to be treated individually. He believes that that we need to “champion the authentic London boozer, because in years to come we will regret what has happened to the ‘pub’”, and this is evident in his delicate handling of The Wenlock Arms. Like any good pub, much of The Wenlock’s character is derived from her locals, and the stories that have unfolded within her bower. During the 2010 London Design Festival, neighbouring furniture designers Established & Sons chose to replace the pub’s usual rickety furniture with their futuristic neon designs. While the company were presumably making some sort of bohemian statement by choosing to exhibit in an old pub rather than at a lavish gallery party, the locals were undoubtedly a little bewildered and perhaps even a little annoyed that their surrogate living room had been infiltrated by the surrounding creatives. However, rumour has it that as soon as the punters realised the monetary value of their exquisitely crafted plastic potties, tables and chairs quickly began to disappear out of the door. Regulars include the likes of 87-year-old Florence Sullivan, who has been drinking at The Wenlock for a solid 70 years. She and a myriad of other interesting characters create the “sense of community which is sorely lacking in many towns and cities across the country,” according to Heath. Just as many human secrets have undoubtedly been exchanged between these walls, a deep clean of the interior uncovered a mosaic which had not been seen for 50 years. Other than updating the lager and wine list and replacing the questionable old bathrooms with something more pleasant, Heath has made few other changes, and seems intent on uncovering the character of The Wenlock for himself, rather than inventing a new persona for her. The bar boasts 10 ale pumps representing at least five London and five national brewers. The Wenlock strives to offer good quality beer – “whether that comes from Orkney or Hackney”. The new proprietors have taken the traditional salt beef sandwich, which has been a staple delicacy for countless years at The Wenlock, and given it a New York City deli-style twist adding gherkins, mustard on rye and caraway seed bread. When their kitchen is complete, they intend to serve roasts on Sundays, preserving the tradition of the great British pub. For the past 18 years, the Brian Masters Jazz Trio have provided a warm and lively backdrop to Friday nights at The Wenlock, and this is not expected to change any time soon. Live bands also play on Saturday nights and occasionally during the week, an increasingly rare diversion in this part of London. The Wenlock Arms is everything a proper pub should be and is more valuable than ever in today’s cocktail flaunting, prosecco-wielding London. The new owners have done a stellar job of preserving her history and adding a few small tweaks, in order to ensure her rough and ready glamour continues to attract new generations of drinkers. As Heath states, “a pub should be a place where everyone feels welcome. 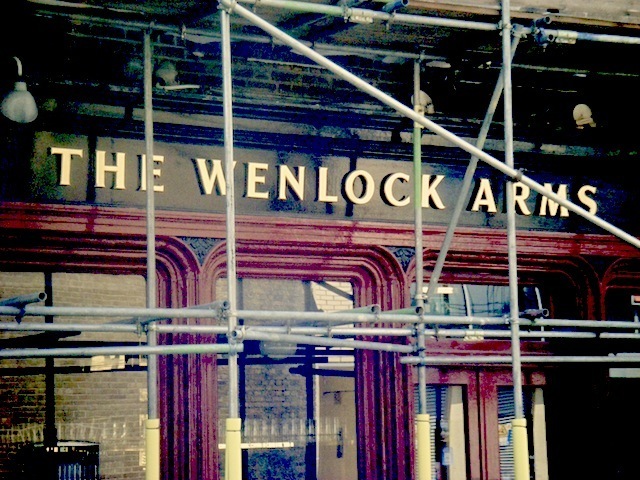 The Wenlock is a very masculine pub but for me, she’s a lady. Pubs are organic – they grow and adapt to their environment and the people that visit them”. So let us raise a glass to Lady Wenlock, long may she prosper. The Wenlock Arms, 26 Wenlock Road, London N1 7TA, 020 7608 3406.